The future of three key sports — football, hockey and athletics — lies in decisions that are to be taken very soon. As these decisions will determine whether our young sportsmen and women rise to stamp their mark or fade away after early promise, it is important that they are made wisely. Popular decisions may not necessarily be the right ones and personal interests should be the last thing on the minds of the decision-makers. To start with, the Football Association of Malaysia (FAM) have entrusted the Task Force headed by Datuk Mokhtar Ahmad to pick a new coach for the national Under-23 team from the three candidates interviewed by representatives from the FAM technical committee and the National Sports Council on Tuesday. The views of the panellists will be conveyed to the Task Force who will then deliberate and make the final decision. The three interviewees are current senior interim coach Datuk Ong Kim Swee, former Philippines coach Michael Weiss and former Estonia youth coach Frank Bernhardt. The two Germans were shortlisted from 70 applicants but looking at their credentials, one wonders if they are the best coaches to chart Malaysia’s future. Sure, whether the coaches wanted to come with their own back-up team and their terms and conditions are factors that would have been considered besides their track record, calibre and experience. But to hire someone who had coached the Philippines (2011-14) and whose only notable achievement was elevating them to their highest Fifa ranking (127) then — they are at 123 now under Thomas Dooley — seems so wrong. Weiss also had many Filipino players of mixed parentage brought down from abroad to add strength his team. The 50-year-old coach, who was a goalkeeper in his playing days, served internship with clubs like Real Madrid, Arsenal, Kaisrslautern and River Plate, to name but a few, was a technical director with Rwanda, assistant manager of China’s Under-20 team and in June 2014, took charge of Romanian former champions Otelul Galati but was sacked only three months later after a single win in seven games. FAM had indicated that they were looking for someone who had knowledge of the football scene in Asia but if that is the only reason they are considering Weiss, then Ong would definitely be a better choice. Ong guided Malaysia to the gold medal at the 2011 Indonesia SEA Games and his local and Asian knowledge is surely better than that of the foreigners. FAM already made a mistake by dropping Datuk K. Rajagobal, who did a great job of raising the profile of Malaysian football, but he was let go in the name of change and external factors that had nothing to do with football. To repeat the mistake would be foolish. Although Ong has baggage, he is still a better bet than the Germans. As for the 46-year-old Bernhardt, his notable achievement is taking the Estonian (five years) Under-19 team to the European Championship elite round in 2009 and 2011. His last job was with Sumgayit FK in Azerbaijan. Let us not change our coaches for the sake of changing. And if we need foreign coaches, they must be reputable with a proven record. It would be better to get a football supremo to be in charge overall of the senior and junior teams and let local coaches handle the teams. This way, the local coaches can be the understudy and take over when the foreign supremo’s tenure has ended. Just like football, hockey is in trouble, having failed to qualify for the 2016 Junior World Cup. Though the team had led 3-1 against Korea earlier in the match, they allowed the Koreans to pull level and lost the game in the ensuing penalty shootout. Malaysia has also failed in its bid to host the 2018 World Cup, the national team lost in the 2015 semi-final of the World League, did not qualify for the Olympics and saw its world ranking slide from 12 to 13. So, it is back to the drawing board for hockey. The 2016 Junior World Cup squad was undoubtedly one of the best prepared with full sports science support but sadly, they lacked the mental strength and intelligence to withstand pressure and make vital decisions. But to disband this squad would be a crying shame. All indications are that the Malaysian Hockey Confederation (MHC) will look at ways to maintain it as a back-up squad. That's wise because otherwise a lot of good talent would go to waste without proper guidance and programmes. Malaysia hosting the 2017 SEA Games would be a springboard for them. As for athletics, the sport is in the limelight for the right reasons, thanks to Badrul Hisyam Manap’s feat at the Asean Schools Games in Brunei where he set a new national record, breaking Watson Nyambek’s 17-year-old 100m record by clocking 10.29 seconds, and the 4x100m relay team (Badrul, Mohd Haiqal Hanafi, Asnawi Hashim and Khairul Hafiz Jantan) winning the gold medal. As expected, everyone is excited and many will jump on the bandwagon to share some of the glory and try and chart the future of these athletes. But how many of them even knew where the Tunku Ismail Sports School (TISS) was? Did they know it had 500 young talented boys and girls for 14 sports? Everyone wants a bit of the spotlight. They are jostling each other to take charge of Badrul and have even suggested that he be brought to the city. A grave mistake was made when Watson was dragged from his quiet life in Miri to Kuala Lumpur, where his full potential was never fully realised. Let us not repeat that mistake with Badrul. He should remain in the fully equipped TISS in Bandar Penawar. Sadly, for a sports school, TISS has minimum sports science elements at present, with one administrator for the unit, a nutritionist, a psychologist and a strength trainer. The unit does not have the best of training equipment, yet it has produced results. So, let’s enhance what has been achieved with minimum facilities and fully support TISS principal Suhaimi Sun Abdullah in producing more sportsmen and women. Let us not cripple the school by taking away its talent. 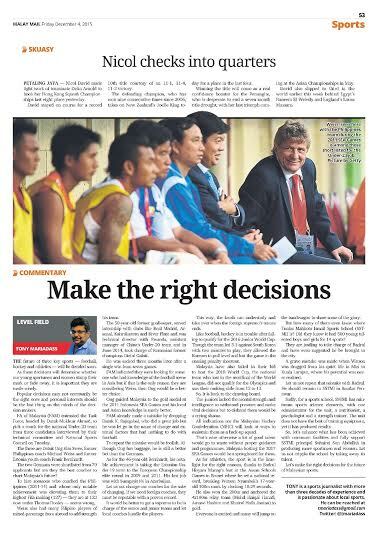 Let’s make the right decisions for the future of Malaysian sports.